My first serious attempt at astro imaging - taken from just outside my back door. 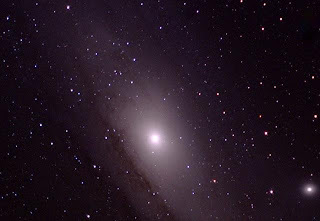 This is the galaxy M31 in Andromeda. Stack of 50 luminance, 25 red, 25 green, and 25 blue frames, along with 25 dark frames. Exposures were 15 seconds (the mount is not polar aligned). Camera is a Meade DS3, at prime focus of an Orion ED80T-CF 80mm F/6 apochromatic refractor. Mount is an iOptron MiniTower Pro. Images were acquired and stacked with Stark Labs Nebulosity. Final tweaking in Photoshop.